The following is a list of the running backs with the highest yards per carry averages in NFL history. These are not all the players with the highest yards per carry averages in NFL history. The player with the highest yards per carry average in NFL history is currently Michael Vick (7.0 yards per carry average), a quarterback. This list is only for running backs. Stats for the AAFC, which existed from 1946-1949 are included. The AAFC had many star players, and the best teams from the league merged with the NFL in 1949. Marion Motley currently has the highest yards per carry average in NFL history for running backs at 5.7 yards per carry. Motley gained 4,720 yards on 828 carries in his career playing for the Cleveland Browns (1946-1953) and the Pittsburgh Steelers (1955). I'm including Marion Motley's stats here from the Cleveland Browns in the AAFC. The Browns played in the AAFC from 1946 to 1949, and then joined the NFL in 1950. Marion Motley joined the Navy during WW II and played football for the Great Lakes Naval Training Station under Paul Brown who coached the team while he was in the Navy. They crushed Notre Dame 39-7 in 1945. When the war ended, Brown became the head coach of the brand new Cleveland AAFL pro football team that was named for Brown, who had been the head coach at Ohio State before the war. Brown asked Marion Motley to play for him and together they dominated football winning the AAFL the four years the Browns played in it and then winning the NFL Championship in 1950, the year the Browns joined the league. Marion Motley was inducted into the Pro Football Hall of Fame in 1968 and became the second black player player to be so honored (Emlen Tunnell was first). Motley wanted to become a coach after his playing days were over but felt he was discriminated against in this regard. Jamaal Charles, the only active player on this list, currently has a 5.5 yards per carry average in his career. Included among Jamaal Charles rushing yards are TD runs of 91, 86, 80, 76, 63, 56, 56, 47, 46, 44 and 41 yards. Charles also has a 97 yard kickoff return for a TD in his career, and a 80 yard run that did not go for a TD, plus TD receptions of 75 and 71 yards. Even though he is behind Marion Motley, in many ways Jamaal Charles has already had a more impressive career. Jamaal Charles has rushed for 7,220 yards (on 1,320 carries) which is over 2,000 more yards than Marion Motley rushed for. 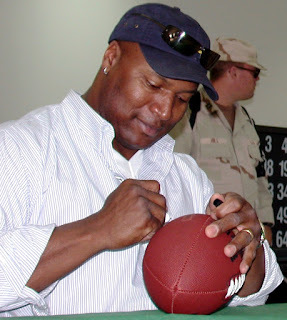 In his NFL career, Bo Jackson ran for 2,782 yards on 515 carries, for a 5.40 yards per carry average. The third highest average for a running back in NFL history. Over just a four year career, Bo Jackson had TD runs of 92, 91, 73, 62, and 55 yards. He also had a 80 yard run that did not go for a TD. Bo Jackson was such a great athlete he also played major league baseball with the Kansas City Royals. Unfortunately, his NFL career ended after just four seasons due to a bone condition called Avascular Necrosis, that forced him to get a hip replacement at age 30. Avascular Necrosis, also called Osteonecrosis, is often associated with long-term steroid use. Bo Jackson has vehemently denied that he ever used steroids. Spec Sanders ran for 2,900 yards on 540 carries playing for the New York Yankees in the AAFC from 1946 to 1950. Sanders had TD runs of 75, 70, 60, 56, 56, and 52 yards in his career. Spec Sanders also threw 23 TDs, had a 76 yard punt return for a TD, had kickoff returns of 103 and 92 yards for TDs, caught a 49 yard TD, and he even returned an interception 50 yards for a TD in his career. Bobby Mitchell was a hybrid player I'm including here because he primarily played running back for four seasons, gaining 2,297 rushing yards for the Cleveland Browns from 1958-1961. Mitchell then played for the Washington Redskins from 1962-1967, where he was primarily a wide receiver. For his career, Bobby Mitchell ran for 2,713 yard on 513 carriers. His career rushing average of 5.33 yard per carry is fifth best in NFL history. He was inducted into the Pro Football Hall of Fame in 1983. The great Jim Brown averaged 5.22 rushing yards per carry in his career. The sixth best total in NFL history, but the highest total for any running back who gained over 10,000 yards in his career. For his career, Jim Brown ran for 12,312 yards on 2,359 carries. Brown played nine years in the NFL, all for the Cleveland Browns, and led the league in rushing yards eight times. He is the only player in NFL history to average over 100 rushing yards per game (104.3). Ernie Caddel ran for 2,311 yards on 443 carries playing primarily for the Detriot Lions in the 1930s. Chet Mutryn ran for 3,031 yards on 583 carries playing primarily for the Buffalo Bills in the AAFC in the late 1940s. Mutryn also played for the Baltimore Colts in the NFL in 1950. Playing for the Los Angeles Rams from 1950-1955, Dan Towler ran for 3,493 yards on 672 carries in his NFL career. Playing for the San Francisco 49ers, Johnny Strzykalski (the Polish Wonder) ran for 3,415 yards on 662 carries in his NFL career. With a 5.16 yards per carry average, Johnny Strzykalski has the 10th highest rushing average in NFL history among running backs.